If you cannot eliminate injustice, you can at least tell everyone about it!" That is Shirin Ebadi's favourite line. Expelled from Iran since the uprising that erupted in the country three years ago, she lives, as some say, "out of a suitcase". Ah, yes, she is also a 2003 Nobel laureate, the first Muslim woman to receive the award. The petite 63-year-old Iranian human rights lawyer is in New York to talk about Iran and her latest book, The Golden Cage: Three Brothers, Three Choices, One Destiny (Kales Press, 2011). The book narrates the three-decade-old history of post-shah Iran as seen through the eyes of a family Ebadi knew. The family members' names have been changed but their experiences are true, she says. Their lives are intended to be a microcosm of the trauma suffered by Iranians since Ayatollah Khomeini and his fundamentalist Islamic supporters overthrew the monarchy. Ebadi is the guest speaker at a luncheon meeting in the cosy hall of the colonial-style building of the Council on Foreign Relations (CFR), the United States' leading think-tank on international relations. As Ebadi plunges her fork into the mound of green salad on her plate, she also answers questions from Isobel Coleman, a CFR senior fellow, who has herself written a book on Muslim women, and from other guests who want to know more about Iran under the repressive regime of President Mahmoud Ahmadinejad. Answering through an interpreter, Ebadi laments that the Iranian regime's intransigence on the demands for change has made the country like "fire under the ashes". She claims that the human rights situation in Iran has worsened to such an extent that people are being punished "even for their thoughts", citing the six-year prison term imposed on Iranian filmmaker Gafar Panahi, whose plans to make a documentary film about the 2009 post-election protests angered the regime. Ebadi is not exactly ecstatic about the present US policy on Iran. She says it would hurt the Iranian regime more if emphasis was put on the country's human rights situation rather than its nuclear ambitions. She supports political sanctions in lieu of economic sanctions that hurt the common people. The Iranian regime was cleverly distorting the US-led United Nations economic sanctions passed last summer to tell the people that the US was trying to deprive them of their basic livelihood. But her own ideas have changed on Iran's nuclear programme. She had in the past defended Iran's inalienable right to have nuclear energy, which was a cause of national pride. Consequently, no Iranian government, regardless of its ideology or democratic credentials, would dare stop it, she had observed. However, the tone and the substance are different now. She dismisses the fact that nuclear energy is the national pride of Iran, calling it Ahmadinejad's propaganda. The Iranian people had major problems in their daily lives and could not even pay their gas bills. "They do not have time to think about it [the nuclear programme]," she said. Japan's recent catastrophic nuclear reactor crisis has shaken the people of Iran, who do not want another Fukushima (the ruined Japanese power plant). She argues that political sanctions require governments to punish violators of human rights and get the International Criminal Court (ICC) involved so that they can be tried. Such demands are, however, laden with a minefield of complex issues, and many nations, including the US, have not officially acknowledged the ICC's jurisdiction. She is also against external military intervention in undemocratic countries. "Democracy is not a commodity you can export … one cannot simply attack another country and export democracy. This will only strengthen the position of dictators, who can use national security as a pretext to take even more repressive action against the opposition," she said later in a one-to-one conversation with Weekend Review. But she seems to endorse President Barack Obama's approach on Iran. While Obama exercised restraint and did not resort to threatening military action against Iran, Bush had spoken about taking military action against the country. "The only thing I can say is, don't threaten Iran," she says. "Iranians don't like being threatened and fortunately he [Obama] has not committed that mistake. He talks to the [Iranian] people and not to the government," she says. Ebadi's life "turned upside down" during the three days of the post-election unrest in 2009, culminating in her expulsion from Iran. One of the first female judges in Iran, she served as president of the city court of Tehran from 1973 to 1979 and was the first Iranian woman to achieve the chief justice status. However, along with other women judges, she was dismissed from that position after the Islamic Revolution in February 1979. She was made a clerk in the court over which she had once presided, until she petitioned for early retirement. 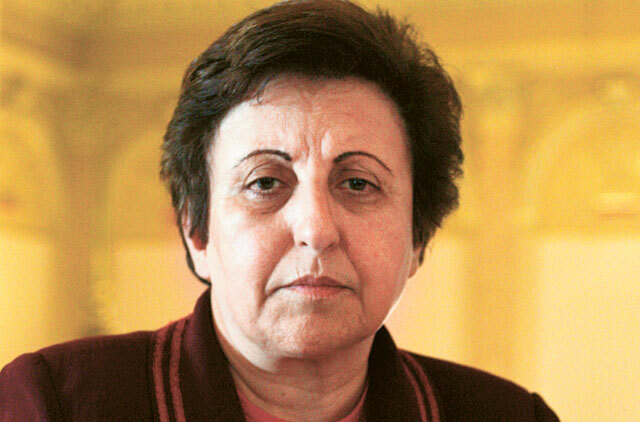 After obtaining her lawyer's licence in 1992, Ebadi set up a private practice, defending political dissidents and even being arrested numerous times. Besides her human rights activism, she has also established many non-government organisations in Iran, including the Million Signatures Campaign that demanded an end to legal discrimination against women in Iranian law. Ebadi believes that the Iran unrest may have inspired the Arab uprisings in the Middle East and North Africa which, she hopes, would culminate in democratic governments that respect and honour human rights and freedom. But her own experiences in Iran were disappointing after Reza Shah Pahlavi's overthrow. She had hoped for "true independence and liberty" after the shah's exit in 1979 when she, as a fiery 31-year-old judge in a Tehran city court, had helped storm the justice ministry and joined protests that led to the installation of Ayatollah Khomeini as Iran's Supreme Leader. Ebadi says in her book that the "… future [after the shah's removal] appeared full of promise". However, the future turned out to be anything but promising; the liberal and secular atmosphere under the shah was replaced by a 7th-century religious fanaticism and brutal political repression. Ebadi says she is keen to avoid bloodshed in Iran and wants the uprising against the present regime to be as peaceful as possible. "As a human rights defender, I don't want people to get hurt." Iran's economic situation is bad. Besides zero growth in 2010, inflation is running high at 20 per cent, with soaring food and petrol prices. But the people are no longer spontaneously taking to the streets. "People are cautious about taking to the streets because they fear being arrested, or even killed," Ebadi says. She lives in Atlanta, Georgia, at present but would like to return someday to Iran, where her husband and her sister still live. She says there is considerable distrust and suspicion among the ruling elite. "There are differences among the fundamentalists themselves. The clergy does not wholeheartedly support the government," she claims. "I do not think that the [Ahmadinejad] government will last long, given the dissent and the economic problems in the country," Ebadi predicts. Manik Mehta is a commentator on Asian affairs.